Christmas is here again and there are lots of exciting things to do and see in the city of Alicante during this time of the year, with plenty of attractions for all ages and tastes. Just to give you a few examples, you can visit Santa's Grotto, admire the beautiful nativity scenes, skate on the ice rink, try the toboggan run, enjoy the traditional festive markets and of course celebrate News Year´s Eve on December 31st! The festive Christmas markets are usually accompanied by live music, activities and games for the children. Alicante´s own Christmas Craft Market is located along Avenida de Federico Soto, the main road from the marina to the Plaza Luceros. The stalls will be open everyday until the 6th January 2016, except Christmas Day and New Year´s Day. They will be selling a selection of goodies as well as figurines for nativity displays. You can visit this market from 10 am to 3 pm and then from 5 pm to 11 pm. You can also visit the house of Santa Claus in the park just below the Castle of Santa Barbara to watch the snow and to enjoy the many activities and gamesin store for the children, music and of course the opportunity to see Father Christmas. This will be open until December 24th. The temporary 35 meter long Toboggan Run is located in the Plaza de la Montañeta from until the 6th January, opening 10 am to 2 pm and 4 pm to 10 pm. 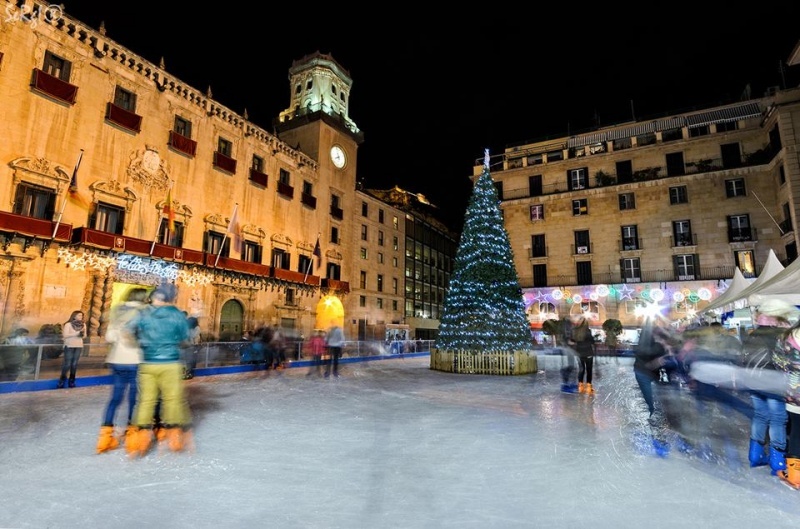 Last but not least, the temporary 390m2 ice skating rink is located in the Plaza del Ayuntamiento until the 6th January and the opening times are 10 am to 2 pm and 4 pm to 10 pm. And don´t forget, the Plaza del Ayuntamiento will be the place to be this New Year´s Eve from 11 pm to 3 am!